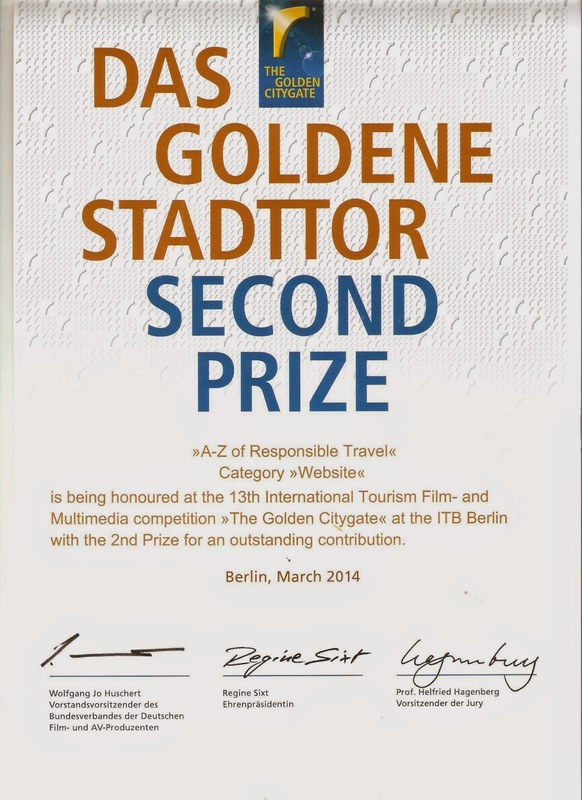 A to Z of Responsible Tourism campaign designed by The Blue Yonder has won second prize at the prestigous Das Goldene Stadttor award 2014 in Berlin. Into it's 13th year of functioning, International Tourism Film-and Multimedia competition is considered as the Oscars of Tourism Industry. Considering that this campaign was designed and implemented with a lot of budget constraints and normally such awards are won by large tourism boards or big companies with deep pocket to spent on PR and promotions, this is a humble recognition to the innovative style in which the all campaign was developed. A-Z of Responsible Tourism was designed TBYA for The Blue Yonder as part of it's initiative to demystify the concept of Responsible Travel. Conceptualised by Zainab Kakal, the initial sketches for the exhibition space of The Blue Yonder at India's first Biennale - The Kochi Muziris Biennale 2012 was done by two design students Akshan Ish and Sudeepti Tucker from National Institute of Design, Ahmedabad, India. Second phase of the backdrop for an interactive installation at ITB Berlin 2013 was completed by Ameya Kulkarni. These were later converted into separate post cards by Binit Basa of Triature with text from Zainab and Jeremy Smith who were associated with TBYA. These cards were used at ITB Berlin to interpret the backdrop on the theme of Responsible Tourism to trade visitors and consumers by Mariska van Gaalen. The interactive installation of A-Z of responsible travel was exhibited once again at ITB Berlin 2014 interpreted by Christopher Lomholt. Irrespective of the fact that responsible tourism is being talked about and practiced in the last two decades, for many in the tourism industry as well as travellers, it's still something like an accessory and not a mainstay in their business or as a choice of travel. 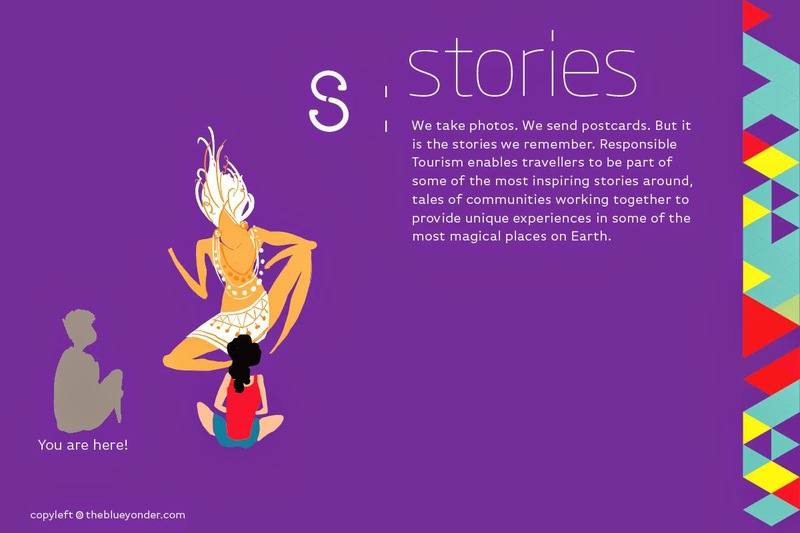 We created these set of cards to demystify the idea of Responsible Tourism. These ideas were crowd-sourced on Facebook mostly through Responsible Tourism Networking Group and other social media in the run up to ITB Berlin 2013. What is interesting for many who followed this campaign was the fact that The Blue Yonder was a tour operator and not a media company. Seeing the struggle the industry had / has in understanding and positioning various travel experiences and pushing Responsible Tourism as a definition similar to viz, ecotourism, we decided to take the responsibility of sharing our concept with them. Responsible Tourism for us is a way to achieve Sustainable Tourism, where sustainability is the aspiration and responsibility is the DNA with which one runs the business. We are not selling responsible tourism, but travel experiences. We created set of cards ( 26 alphabets) which are available both offline and online, which are being used by several universities and European Tour Operators to train their team on Responsible Tourism. Indeed our guests love them too!